1. Pick a specific moment, and grow from there. Give us the sense that you’re speaking from your authentic voice, pulling us into the scene, and seating us beside you. Make it a story that only you can tell. 2. Revise revise revise! We believe that great writing comes through vigorous revision, so we encourage you to edit your work. Great writing is rewriting. Genius lies in revision. 3. Use all the resources at your disposal. We encourage you to read our guidelines about what makes a winning story or essay, and we encourage you to ask your teacher for feedback and help. 4. Seek inspiration! Create a free Narrative account, and then head over to our reading list, with works chosen specifically to give you a sense of the style and quality of writing we publish. 5. Create an original piece for this assignment. This contest offers the opportunity to push yourself outside the bounds of academic writing, to flex your creativity in a new context. Don’t send in an analytical or college essay, as these stick out like turnip buds. BEFORE YOU SUBMIT: Review this checklist to make sure your essay is ready for Narrative’s consideration. •	Your name is printed in the top left corner of the page, followed by your school, English teacher, class period, and email address. We need to be able to reach you! •	Your essay is no more than 600 words long, typed in 12-point font, and double-spaced. •	Your teacher has your final draft in a Word document. •	Your account lets you read past winners and any of the other thousands of literary works published in Narrative. 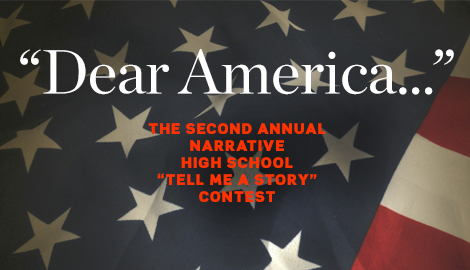 Don’t forget to sign up for Narrative before submitting your final draft to your teachers!